The GlideStop's Patented Index System allows the stop to return to any preset position quickly and accurately. The indexes can be easily placed for any standard lengths and can be placed as close as 9/16" apart. Unlike other systems our fence is not hindered by multiple stops. The Glidestop can be placed anywhere along the fence regardless of index placement. 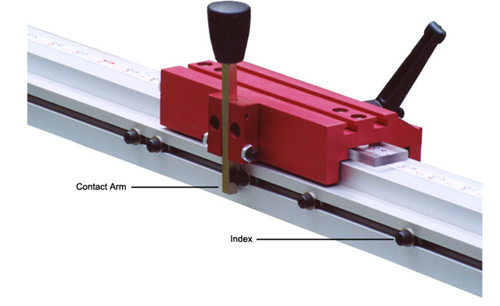 The Indexes are meant to be placed in accordance with standard cut lengths. When a standard piece is to be cut, the user needs only to move the stop down to the proper index and tighten the stop. This way everyone in the shop gets the same cut every time. 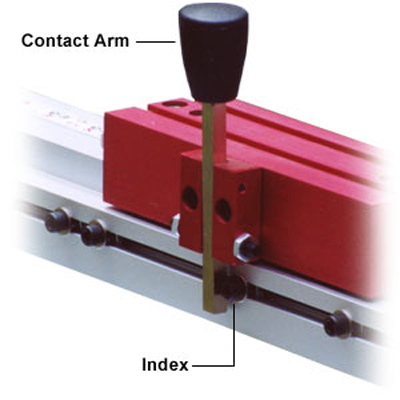 To reposition the stop, loosen the handle and squeeze the contact arm to bypass the indexes. When the desired index is reached, release the contact arm and slide the stop against the index. Indexes are easily added and can be positioned in seconds.